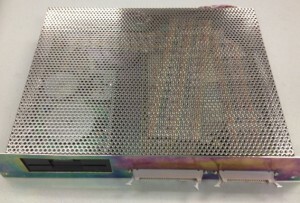 Canon Stepper Disk Unit contains an internal hard drive, a floppy drive, and an interface board. When the Disk Unit fails, most likely it is due to its traditional internal hard drive. The internal hard drive has programs for Main CPU, TV CPU, and OPTF CPU. These programs are console software version specific. When replacing the Disk Unit, these programs need to be restored to the new internal hard drives in order for the system to reset. The Disk Unit hard drive is obsolete. To cope with this, we replaced this traditional hard drive with our compact flash drive. Not only does a compact flash drive run faster, but it is also more reliable because it does not have any moving mechanism.